The Osaka Hotel in Nakanoshima, Osaka. The Osaka Hotel was Osaka’s premier Western hotel. It opened in 1881 (Meiji 14) as the Jiyutei Hotel (自由亭ホテル). 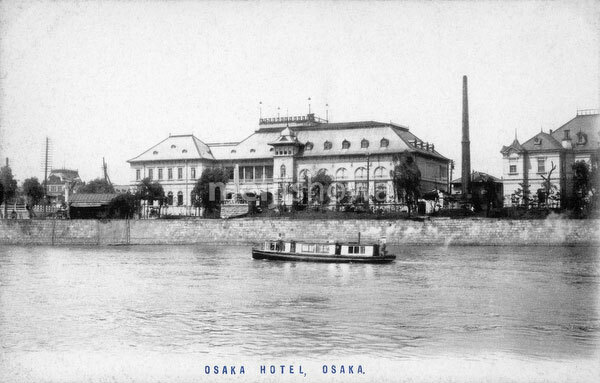 In 1895 (Meiji 28) it was renamed the Osaka Hotel. It boasted electric light, steam heating as well as English speaking personnel. In (Meiji 34), during construction for remodeling, the hotel burned down. It was replaced in 1903 (Meiji 36) by the building in this image. But in 1924 (Taisho 13) this building was destroyed by fire, too. It was not rebuild again.